There appears to be a spiritual covenant hidden inside the Paris Agreement which may be contributing to the hurricanes in the US. Cost includes 428 days of access after purchase date. America is no stranger to hurricanes on the Atlantic Coast and the Gulf Coast, yet it would seem that the beginning of this season is more severe than usual. The evidence suggests that there was a secret spiritual covenant hidden inside the Paris Agreement. When President Trump pulled out of the visible terms of the Paris Agreement, some spiritual penalties were activated against us as a nation. This broadcast will be a discussion of the spiritual principles operative when there is a secret covenant inside a contract, as well as an exploration of what people of faith are able to do when the nation is covenanted to a spiritual force without the knowledge, permission and participation of the citizens. The teaching will contain principles that can be applied to many similar situations. However, at the end, we will do a court case in heaven, seeking reprieve and redress of wrongs. For this reason, we would value a very large representation of American citizens from many streams of faith, coming into agreement with us on this matter. What a great privilege to be part of a global tribe interceding for world events! What a great honor to serve the King of kings and Lord of lords who defeated the prince of the power of the air in his own turf - and what glorious victory is ours as noble subjects of our great King! Loved it! Thank you Arthur and Team! When is weather related to spiritual issues? According to the Bible, a LOT of the time. Can people who did not cause the problem help resolve it? According to the Bible, absolutely yes! 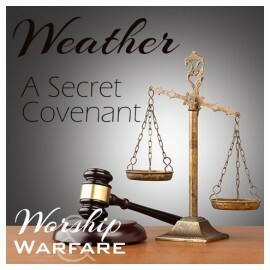 Come explore the hidden facets of today's weather issues.